Several years ago, I read the book "The 5 Love Languages" by Gary Chapman and to this day I think it is one of the most fascinating and eye opening books about love and I believe that every spouse should read it. It helps you to understand that the way you are expressing your love may not be received in the way that you think it is. 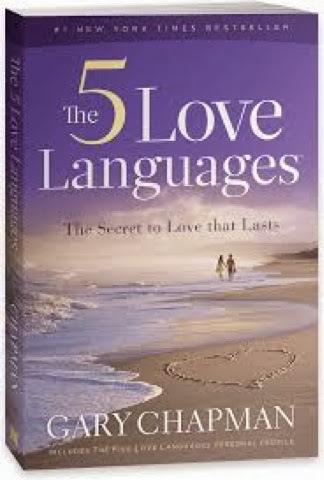 The basic premiss of the book is that we all speak one of the five different love languages. The love language that we speak is how we express our love for each other. It is also the most favorable way that we receive love. So, a husband and a wife may be madly in love with each other but if they are expressing their love to the other in a language the other isn't speaking then that love isn't being communicated and that person is not feeling loved. Then problems arise because that love that the couple has for each other is not being communicated. So, the key is to determine what love language your spouse speaks and communicate to them in that love language, even though it may not be your primary language, so that they more fully receive that love you have for them. An example is the husband who constantly brings home gifts for his wife but she is frustrated because she just wants him to help around the house more often. He then gets upset because she is fixing dinner instead of appreciating the gift. It is important to know your spouses love language not only so that you can communicate your love to them in that language but to hear it from your spouse. I think a reason I enjoyed this book so much is because my wife and I don't speak the same love languages. I have no doubt that Abby loves me but there are times when I'm sad and lonely because she is not speaking my language. I actually have two----"Words of Affirmation" and "Physical Touch." When she isn't speaking those languages, I have feelings of rejection and my self-esteem tanks. It is in those moments that it is important for me to hear her communicate in her love language---which is "Quality Time." So, I realize that her going to the store with me or watching television with me are ways that she expresses her love for me. And I, in turn, have to make sure that I plan dates nights and such for her. We can't alwaysexpress our love for our spouse in the way that only makes us happy. Buying your wife a bowling ball when she does not bowl (like Homer Simpson did for Marge) doesn't make sense. Sometimes, we have to get dressed up and go to the ballet. Sometimes we need to take time to tell her how beautiful she is, or buy him the video game he wants, or hold hands. Whatever your loved one wants. If you have not read, "The 5 Love Languages" then order it today. Download it to your Kindle or Nook and read it tonight. There are some great ideas in there for showing your spouse you love them. You can also checkout their website at 5 Love Languages.com. I have never read this book although I have heard many recommend it highly just as you have. When my wife and I were going through our marriage prep our priest had us read a different book but one that I think many should read as well. It's called Love & Respect: The Love She Most Desires; The Respect He Desperately Needs. I think it would go great with Love Languages at least by the sound of it.